With the quick development of refrigeration equipment market, there are more and more large, low temperature walk-in freezer, ice-making device and quick-freezer. 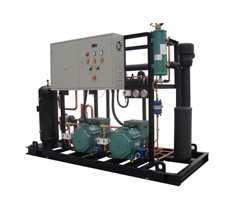 The reciprocating compressor of freon is hard to meet the requirement, The BLGS series semi-hermetic low temperature screw compressor condensing units developed by our company can meet the -25℃~ -40℃, which can be widely used for the larger equipment required for low temperature. 1). 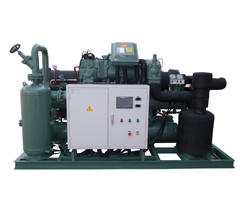 Use the Bitzer semi-hermetic screw compressor made in Germany, which has the high efficiency, long life span, less vibration and low noise etc. 2). It is of complete configuration, with the main refrigeration parts and control accessories from world famous brand, having high reliability. 3). The units has multiple and safe protection for reverse rotation, overheat, overload, discharge temperature, low oil level, and high & low pressure in the system etc. to ensure the reliability in the performance. 4).The units is with economizer, which improve the capacity under low temperature condition greatly. 5).It is of multi-stage energy adjustment, to suit the change of different cooling load, and reduce the energy consumption effectively. 6). Specification is as the PDF file.